We provide guidance across all capital markets communications including investor relations, financial media relations, buy-side and sell-side outreach and investor access. We help ensure your share price locks in your performance to date and future potential. Our team has expertise and experience in supporting corporate events such as IPOs, M&A transactions and restructurings. We know that investors are more sensitive than ever to news, comment and changes in the political and regulatory environment and provide you with advice across the whole range of possible political and regulatory risks. We know that financial communications require intelligence and experience, which is why all our programmes are undertaken by Partners and senior advisers working directly with you. > Elisabeth advises companies on their investor communications. Her experience includes leisure, natural resources, energy and tech. 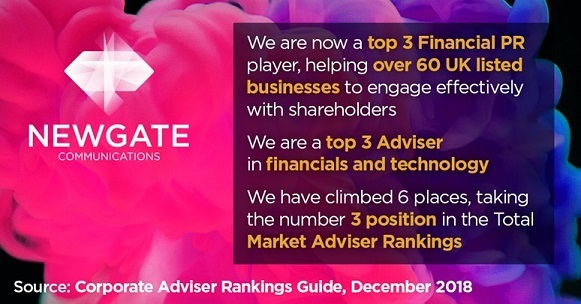 > Adam advises Newgate’s listed clients on all their strategic and capital markets communications.